Fancy a new handheld milk frother? Or you are sick and tired of spending a small fortune in your local coffee shop. Either way, one of my thirteen top handheld milk frothers is bound to suit your budget and meet your needs. For those of you in a rush, the chart below contains my top four models. Check Price The best handheld milk frother out there, bar none. Phenomenal power and great customer service combined. Check Price This is the best model for all of you multi- taskers. Milk is frothed and butter, oils and powders are mixed with ease. This is the best model for all of you multi- taskers. Milk is frothed and butter, oils and powders are mixed with ease. But first, what exactly is a handheld milk frother? Handheld milk frothers look a bit like an electric toothbrush and they are a similar size. Although handheld milk frothers look and work slightly differently depending on the model, they are very similar in lots of ways. Most of them are about 10 inches tall with a thick body with a spindle attached. Looking at the diagram above, a milk frother has a “body” which houses the batteries. The body is also the part that people hold. Somewhere on the lid or the body will be an on/ off switch. Below the body will be an thin rod, arm or spindle at the end of which is a whisk. It is the spindle that rotates at high speeds. After that “show and tell” it is time for a bit of a history lesson. Handheld Milk Frothers have come a long way in the two decades since the first models were available. Then they were designed for the cappuccino and latte lovers who wanted to recreate their favorite coffee shop drinks at home. As that market has continued to expand, people’s taste in coffee has changed. Not only do users want to foam dairy milk, they also want to foam plant based milks, such as almonds. But it doesn’t start and stop with milk, oh no! People like to add butter, oils and a whole variety of powders into their coffee. And they want an easy and cost effective gadget to use. But if you want to froth milk or mix liquids and powders, handheld milk frothers aren’t your only choice. In the next section, let’s look at what your other choices are. There are 4 main alternatives to handheld milk frothers but they are all much more expensive in price and far larger in size. As I look as these alternatives one by one, I will highlight their pros and cons, in comparison to handheld milk frothers. OK, let’s start with my oddest choice, the blender! Yes, I know that strictly speaking a blender does not froth milk. 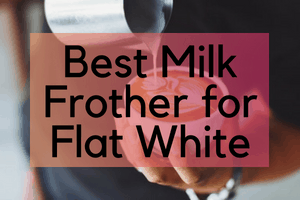 It is part of this list because quite a lot of people who are looking for a handheld milk frother are bullet coffee lovers or keto diet fanatics who are looking for an easy way to mix different oils and powders into their coffee. After all, who wants to be manhandling and cleaning a blender everyday? Electric jug frothers look identical to hot water kettles but they heat and froth milk instead. Looking like a French press, a manual milk frother has a container and a plunger with a whisk at the end. I am not sure that these devices are used that widely. Seen by many as the ultimate way to froth milk because that is what coffee shops use! Once upon a time, you could buy a stand alone steam wand but now the only real way to own one is to buy an espresso machine. Now that we have explored the alternatives to handheld milk frothers, we can start to look at the key features in a leading frother. To start off this guide, I want to offer a piece of general advice. After reading lots of reviews as part of my research for this article, it is obvious that regardless of what brand of handheld milk frother that you buy, every one will be extremely fragile and will need to be handled and stored with care. Handheld milk frothers have two main parts; a handle and a whisk. When you are cleaning your frother under a running tap, make sure that it is only whisk that you rinse. Don’t get the handle wet as many of them are not waterproof. Your frother will need to be stored properly either in a stand or carry case. This will protect the whisk and stop it from being bent. Because the whisk rotates at such high speeds, the whisk arm needs to remain perfectly straight, otherwise the frother won’t work properly. Always use the stand or carry case to store the frother in and make sure that you choose a model from my list with good customer service in case you do damage it. Now that I have finished dishing out a general piece of advice, it is time to move onto some specifics. Perhaps the most important quality to look out for is that the whisk on your frother needs to be stainless steel and preferably food grade stainless steel. After all, you will be using this in your cup of coffee! Food grade stainless steel just means that the metal is durable enough to be used to prepare food without rusting. Food grade stainless steel can be labelled as “304”, “18/10” or “18/8”. The trouble is that in my experience not many handheld milk frothers have this detail in their specifications! But, if it is mentioned by the manufacturers, then I have included it in my details section. Most of the handheld frothers on the market are powered by batteries. Most of these are powered by two AA batteries, however some of the newer ones are powered by three AAA batteries instead. And a real annoyance to me is that many of these frothers do not supply these batteries. You need to buy them yourself. Another new development in batteries, is that some of the very latest models don’t use AA or AAA batteries at all. Instead, they have a lithium ion battery built- in and they are recharged via a USB lead. But I look at this in more detail in a later section. This is a very important feature in any handheld milk frother. In other words, how quickly does the blade on the frother rotate. The faster a blade rotates, the more quickly air is added into the milk and the sooner your froth will be ready! The Gold Standard for handheld frothers is 19,000 RPM. This is a guide to the approximate time that it will take to froth your cup of milk to perfection. Handheld milk frothers are very handy gadgets but storing them can be a bit of a problem. That is why the top rated products come with a stand, allowing you to store your frother on the worktop without taking up too much space. After all, if you put in a draw with all your other utensils you might not be able to find it in a hurry again. Some models don’t come with stands but instead come with flat bottoms so that they can be stored upright without the need of a stand. As the market for handheld milk frothers has developed, the ways in which people use them has changed. In response to people using their frothers at home and at work or when they are out and about on a camping trip, manufacturers have started to include carry cases with their frothers. they protect the frother from damage. they stop the frother from turning on accidentally and draining the battery down. Another recent trend with handheld frothers is for them to have not one but two whisks at the end of the whisking arm. One of the most important qualities to a milk froth, is the amount of air that it contains. A double whisk blade will add air into the milk more quickly than one single whisk blade, which as well as making the frothing process quicker, might improve the quality of the froth. Another emerging trend with handheld frothers is for them to be USB charged. For many people, this will be more convenient that using AA or AAA batteries. A USB charging cable can be plugged into a laptop or you might be able to use your phone charger. But one thing that you won’t need to do is to keep buying new batteries. No milk froth is complete without a little bit of latte art- the wonderfully ornate patterns that you see on top of the best cappuccinos. And so some of the most recently released milk frothers come with a set of patterned stencils that allow you to make patterns on top of your froth using chocolate powder. This is a bit of an odd one. Some handheld milk frothers come with a brush attachment. I was struggling to work out why a brush would be needed with a milk frother. And it is to help you to wash your cup. To be honest, I am not sure that a brush is strictly necessary! What Makes This Handheld Frother So Special? The Powerlix handheld milk frother is one of the most highly rated models on the market- and it has received thousands of reviews. It’s best feature is the fact that it is so powerful. The stand out feature of the matchadna frother is its ability to help make great lattes. The stand out feature of the Elementi frother has incredibly high ratings from the people who have bought it. Mixes butter and oils into coffee well. For those eagle eyed readers out there, it would seem that there is very little difference between the Bean Envy and Elementi milk frothers. They look like identical twins. I would go with the Bean Envy. Although it is slightly more expensive, the customer service and lifetime warranty seem to be huge winners. The stand out features of the Cafe Casa frother are its build quality and really solid construction. This frother, quite uniquely, feels like a well made gadget. And that it works at two different speeds- giving you more control. The stand out feature of this frother is that it comes with a spoon, which is a bit of a gimmick. Although the company will willingly send out replacement frothers to customers, they pressure customers to leave them positive reviews. I am not sure that this model has any stand out or unique features. In fact, completely the opposite. This frother looks incredibly similar to the Elementi and Bean Envy models highlighted earlier. And my opinion has not changed. Of the three models, my favourite is Bean Envy. This is the perfect milk frother for those people who like creating latte art. No need to buy batteries! The Kuwan Milk Frother stands out because it can be charged via a USB lead, whilst most other models still use AA batteries. This Bonsen frother special feature is that it is rated very highly by its buyers. The Sedhoom’s most awesome feature is that it has a double whisk at the bottom of the whisk arm. Two whisks add more air into your milk than just one whisk. Which will help you achieve your best froth in less time. But if using the arm with two whisks on is too powerful, then use the spare arm which has only one whisk on the end. As a newcomer this frother does not have many reviews as yet- although they are all very positive. I feel that this newcomer to the handheld frother market is unique in my selection because it comes with a brush. And I am not sure whether the brush has any practical purpose or is just a gimmick. Will it really make it any easier to clean your coffee cup as against using a sponge?